On Nov. 14, the Gonzaga-Santa Clara game looked like a yawner on the schedule. Santa Clara, picked ninth in the preseason West Coast Conference poll, lost its season opener by 17 at home to Prairie View A&M. Gonzaga was two wins into its 9-0 start. On Nov. 15, Santa Clara took out a full-page ad in The Spokesman-Review with GU coach Mark Few’s partial-quote “ … other (WCC) programs aren’t even trying” at the top, and a picture of SCU’s future 50,000-square foot Athletic Excellence Center and ‘Game On’ in large type below. “We wanted to set the record straight that Santa Clara University is investing and we have made a commitment,” athletic director Renee Baumgartner told S-R columnist John Blanchette at the time. The $4,000 ad obviously raised some eyebrows in Spokane and around the conference. On Nov. 21, the Broncos were still searching for their first win and the Zags were on their way to No. 1 after downing Duke in the Maui Invitational championship. It’s what Santa Clara has accomplished in the last five weeks that has injected some intrigue into Saturday’s matchup at the McCarthey Athletic Center. The Broncos (9-6) have won six straight and eight of their last nine. They knocked off USC in double overtime and defeated Washington State in Spokane. They opened WCC play Thursday with an impressive 68-56 win over San Diego, building a 25-5 lead midway through the first half. They’ve rallied after losing two-time All-WCC guard KJ Feagin to a broken thumb in mid-November. Starting center Fallou Ndoye is in a walking boot after being injured in the fifth game. Two-year starting guard Matt Hauser called it quits before the season because of a chronic foot injury and incoming freshman Juan Ducasse is sidelined following knee surgery. SCU has uncovered quality replacements. Southeast Missouri transfer Tahj Eaddy has emerged as a go-to scorer. The 6-foot-1, 165-pound guard took over against San Diego, scoring a season-high 30 points. He’s been in double figures in 14 of 15 games. Freshman guard Trey Wertz, a 6-5, 180-pounder from Charlotte, North Carolina, had 28 points against USC and 33 vs. Jackson State. He’s averaging 12.2 points and 4.9 assists. Freshman wing Keshawn Justice doesn’t start, but he’s a 3-point threat and produces 10.5 points per game. Forward Josip Vrankic, one of the team’s few returners, averages 13 points and 5.6 rebounds. Cal Poly grad transfer Josh Martin averages just 7.3 points, but the 6-7 forward ranks second in the WCC in rebounding at 9.9. Martin hits a team-leading 45.5 percent beyond the arc and 20 of his 35 field goals are 3-pointers. 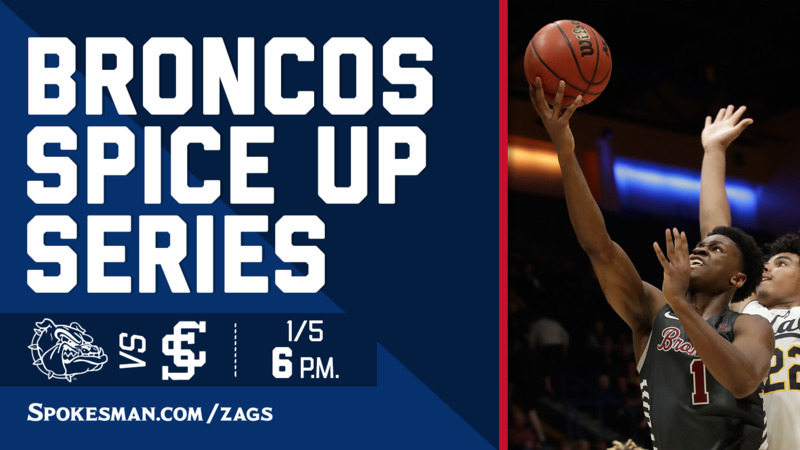 Still, the Broncos could be facing an uphill battle against the Zags, who have won 17 straight in the series and 39 of the last 41. Gonzaga’s 101-52 victory last year in Spokane was the most lopsided in series history. Published: Jan. 4, 2019, 7:09 p.m. Updated: Jan. 4, 2019, 8:53 p.m.